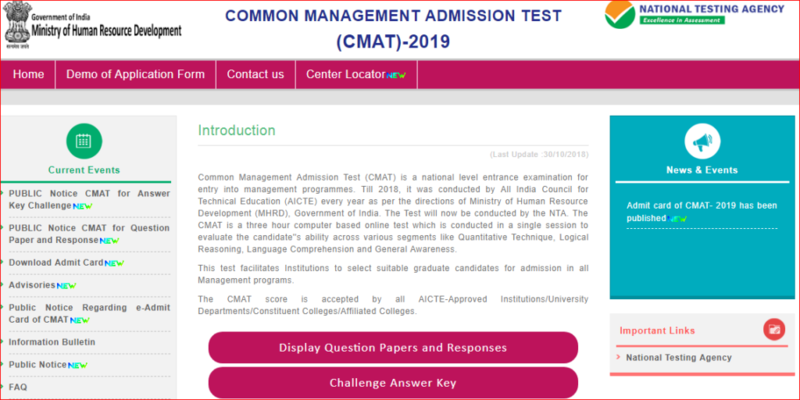 CMAT 2019: Common Management Aptitude Test 2019 Merit List has been released by the NTA. CMAT 2019 result has been announced on 08 February 2019 on the official website. Common Management Aptitude Test 2019. 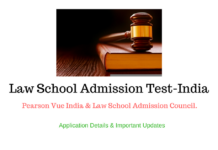 Common Management Admission Test 2019 official Answer Key has been released on 01 February 2019. CMAT 2019 Online Application Form has been available from 01 November 2018. National Testing Agency will conduct Common Mangement Admission Test (CMAT 2019) all across the country from 2019 onwards. 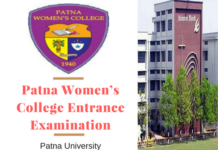 It is an All India Level Entrance Examination which takes place to offer admissions to management courses (MBA, PGCM, PGDM, Executive PGDM, etc.). The candidates can get admissions in all AICTE – Approved Colleges, Institutions, and Universities. The examination will take in online mode. It will be conducted in the month of January 2019. 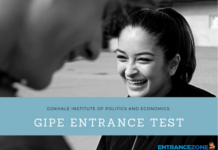 Common Management Admission Test 2019 and GPAT 2019 online registrations to begin from 01 November. Until 2018, CMAT was conducted by All India Council for Technical Education (AICTE) every year. 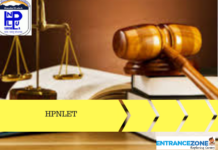 Now as per the directions of the Ministry of Human Resource Development (MHRD), Government of India the Test will be conducted by the Nationa Testing Agency. Read about Management Exam (CMAT) conducted by NTA Here. 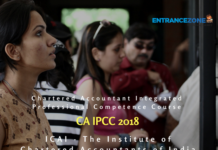 How many times the CMAT exam is conducted in a year? 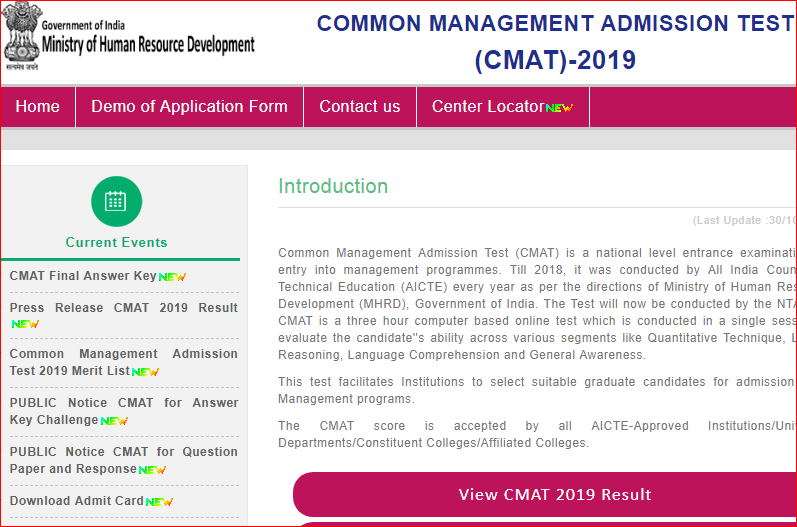 How to Download CMAT 2019 Admit Card? Which colleges accept CMAT score? What is the difference between MAT and CMAT? The CMAT 2019 Merit List has been released by the NTA on 07 February 2019. Sharma Navanshu Surendra is a topper with 100 NTA Score. He secured 372 out of a total 400 marks. NTA releases CMAT 2019 Merit List for 54516 candidates; 1 candidate bags 100 percentile. CMAT 2019 Result has been declared on 06 February 2019. The CMAT 2019 official Answer Key has been announced by NTA on 01 February 2019 on the official website. The CMAT 2019 test has been over on 28 January 2019. The answer key will publish within 1 week after the examination. It is expected to be published by 01 February 2019. 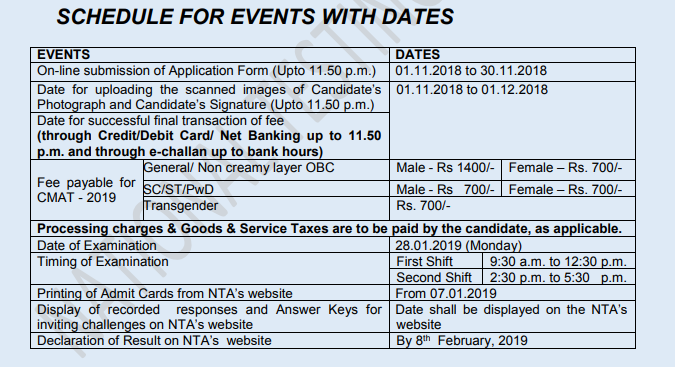 CMAT 2019 Admit Card is going to be released today i.e, on 07 January 2019 by the evening around 6.00 PM. The last date for CMAT 2019 Online Application Form is 07 December 2018. Common Management Admission Test 2019 Image Correction has been started from 05 December 2018. 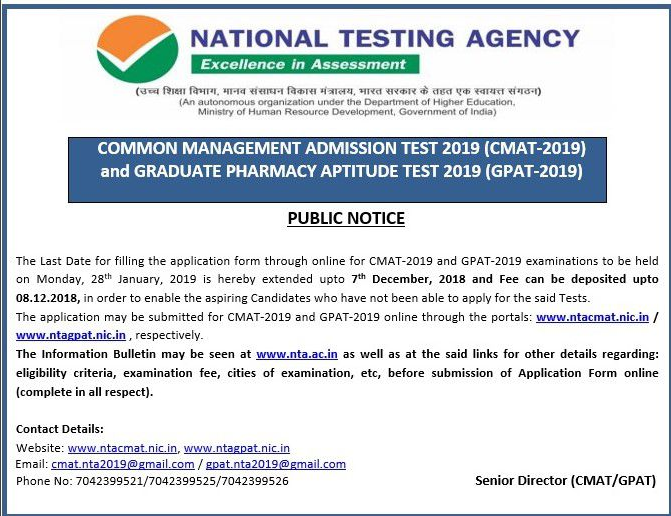 National Testing Agency (NTA) has extended the registrations date of the Common Management Admission Test (CMAT) from 30 November to 07 December 2018. 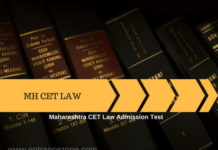 There is no age restriction for appearing in CMAT-2019. Firstly, search for CMAT official Website i.e. ntacmat.nic.in. Secondly, now Click on the Result button. Furthermore, enter the Registered Email ID and Password. Finally, Result will be displayed on the screen. 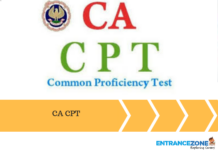 Also, download it and Take the printout of Common Mangement Admission Test (CMAT 2019) result for future reference. NTA has announced the official answer key for CMAT 2019 on 01 February 2019. Applicants can check official CMAT 2019 Answer Key with the answers marked by them in the exam. Applicants will now raise objections in the CMAT Answer Key if there are any errors. Aspirants can now challenge this by paying Rs 1000/- per question. Firstly, go to the official website of CMAT 2019. Secondly, applicants need to log in the portal using email-id and password. Now, click on the tab “CMAT Download Question Paper”. Applicants need to download the question and answer key which is available in PDF format. Finally, aspirants can now compare their answers with the answer key’s answer. In addition, it is advised for candidates to save the answer key for future use. 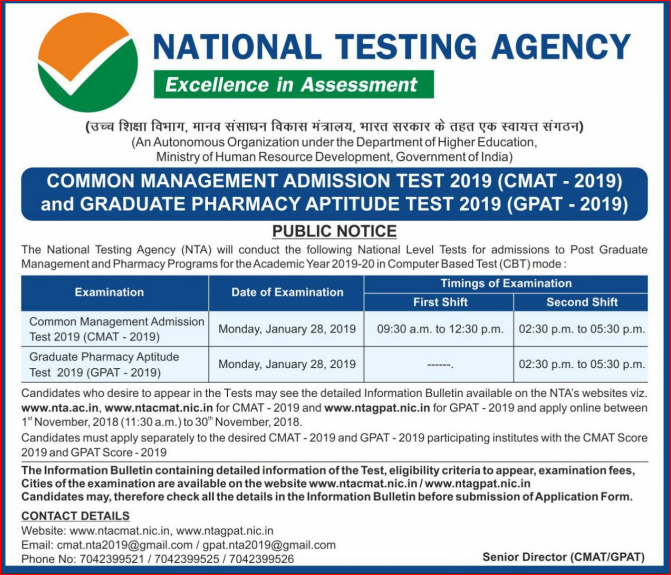 The CMAT exam is conducted only once a year, The CMAT-2019 will be conducted on 28th January 2019 by National Testing Agency (NTA). Given below are the dates released by the council. They are very important for an aspirant and must be checked after every alternate time for any updates. Also, the pdf format of the same is given below for downloading purposes. It should be saved with the aspirant for further uses. 28 January-2019 First Shift 09:30 a.m. to 12:30 p.m.
Download NTA CMAT 2019 Information Brochure Here. Firstly, the application form for Common Management Admission Test 2019 will be available through online mode only on the official website. Also, the registration for CMAT 2019 will begin from 01 November 2018. Then, before filling the application form, the candidates must read the instructions and register themselves. Further, the applicants can pay the application form fee through online mode or offline mode. After paying the application form fee, the candidates can fill the remaining details. The applicants also need to upload their recent photograph and signature in permissible format. The aspirants must check all the details carefully before submitting the application form. Finally, the applicants should take a print of the application form and keep it safe for future reference. Application Fee: The applicant can check application fee for the exam. Also, the payment methods are given below. Doubts regarding the same can be easily cleared after reading them properly. The applicants need to pay the application form fee of Rs. 1,400 /- (for Unreserved and Other Backward Classes) and Rs. 700 /- (for Scheduled Castes / Scheduled Tribes / Persons With Disability). The candidates can pay the fee online through Internet Banking / Credit Card / Debit Card. The aspirants can also pay the fee offline through Challan payment at any nearest branch of State Bank of India. Examination level National Level & Accepted by all AICTE affiliated colleges. Purpose of Exam To get admission in Management Post-Graduate courses i.e. 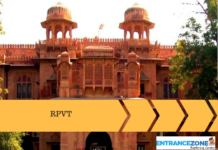 MBA, PGCM, PGDM, Executive PGDM, etc. These criteria given below are the minimum requirement for every candidate, which they should be able to fulfill in order to sit for the exam. Nationality: The candidates must be of Indian nationality to become eligible for this examination. Qualification: The applicants must be in possession of a Graduation Degree in any stream from any recognized College / University. Appearing Candidates: The students appearing in the Final Year of Graduation who will get their result before the commencement of admission are eligible for application. CMAT 2019 Sectional Composition: There are four Sections of CMAT 2019 are given below. Is there negative marking in CMAT? Firstly, visit the official website of CMAT. Secondly, click on the “Existing User” tab. Also, enter your email Id and password in required spaces. 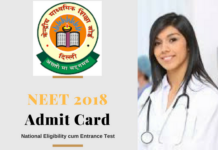 Furthermore, look for the link to Download CMAT Admit Card 2019 there and click on it. 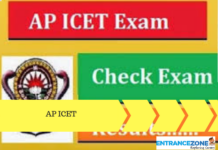 Finally, Download and take a printout of CMAT Admit Card 2019. As per the CMAT official website, All AICTE approved Institutes / Departments / Constituent Colleges / Affiliated Colleges of Universities are expected to accept CMAT scores. The CMAT result will be compiled on the basis of final answer keys. 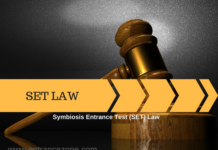 No grievance with regard to answer key(s) after the declaration of result of CMAT-2019 will be entertained. The raw (actual) marks obtained by a candidate will be considered further for computation of the result of CMAT-2019. 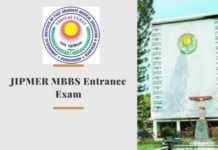 No scorecard will be dispatched to the candidates and the candidates are advised to download their scorecards from the website: www.ntacmat.nic.in only. There shall be no provision for re-evaluation/re-checking of the Score. No correspondence in this regard shall be entertained. 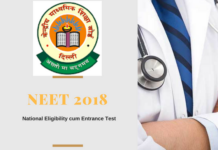 The National Testing Agency (NTA) is an examination conducting body and will provide the CMAT Score 2019. The NTA does not collect the information regarding the total number of seats available in the institutions and reservation criteria followed by the institutions. 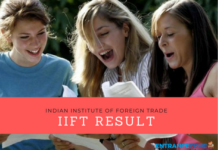 Firstly, both the exams are the entrance test for Management Courses in India. The MAT – Management Aptitude Test is conducted by All India Management Association. And CMAT – Common Management Admission Test is conducted by the National Testing Agency (NTA). What is the CMAT ID? The CMAT ID is an identification number issued to candidates for all the document related queries. The CMAT ID is important as students can log in and view all the important documents on CMAT official Website. The things will change from 2019 exam as now National Testing Agency is going to conduct the CMAT Test. This year, approx 60,000 applicants appeared for CMAT examinations. Alliance School of Business, Bangalore. 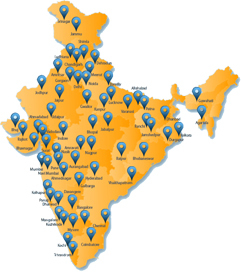 CMAT is conducted all over India and widely spread across major Indian cities. First of all, candidates have to complete the online registration process for counselling. After registration, candidates have to select the college and lock their seats. After that, candidates are required to bring all the required documents at the time of counselling. College authorities will verify the documents and allocate the seats to the candidates. Candidates are advised to report at the college campus in reporting time. Stay tuned with EntranceZone for more updates and information related to CMAT 2019. Can I cancel my application and apply for the refund of CMAT registration fee once after paying it?